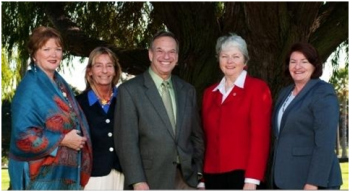 April 20, 2012 (San Diego) –Prominent women leaders in San Diego will be speaking out to support Bob Filner’s mayoral candidacy this Saturday. “Bob Filner is the only candidate for mayor who has spent his career fighting for women's rights,” a press release from the Filner campaign states. In Congress, Filner co-sponsored the Lilly Ledbetter Fair Pay Act. He is endorsed by the National Organization for Women (NOW) San Diego chapter and has earned an “A+” from Planned Parenthood for his voting record to support women’s rights. Local women political leaders supporting his campaign include Councilwoman Marti Emerald, former Councilwoman Donna Frye, State Senator Christine Kehoe, and Assemblywoman Toni Atkins (see photo). Women leaders will rally for Filner’s candidacy for Mayor this Saturday at 10:30am in front of the Kate Sessions statue near 6th and Laurel in Balboa Park (google map).